All of the steps of the Alchemist’s Curriculum can be used to meditate or celebrate with ritual. Although ritual and mysticism are the particular focuses of the seventh and final step, it is necessary to embark down that road from the very beginning. We have already considered several related topics. At this point it is appropriate to introduce the central meditation of the Royal Art Society. This is the central meditation of the Royal Art Society. 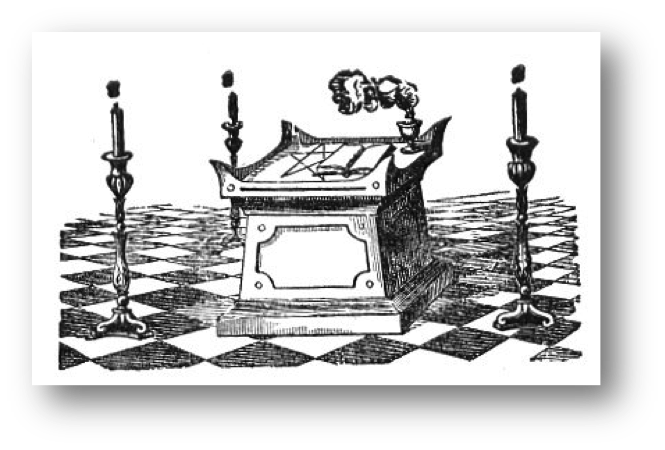 If the Elixir of the All-Seeing Eye of the Royal Art Society is begun in the morning and finished at night, everything in between is ritual, and life becomes a ritual. The alchemist may practice any of the four elixirs that comprise the Elixir of the All-Seeing Eye daily or reserve them for a weekly, monthly or annual service. At any rate, the alchemist’s routine ought to be repeated until it can be done in entirety from memory. This discipline must be endured, for it is not just a test of the alchemist’s memory, but it is a test of will. Many will neglect this practice as a result of unrecognized pride. These will never be true alchemists, for they will lack the discipline and the subsequent confidence born of the mastery of proper ritual, that is, standard alchemy. Beware of falling into this trap, for in this trap, one loses the command of one’s soul. The Immortal meditates upon the Ouroboros and metaphorically rides upon the back of this eternal dragon. The Immortal is taken up into heaven and placed upon the throne of the High One. In visualization, a heavenly Alchemical Palace symbolizes the home of the Immortal Emperor, the temple not made with hands. The creation of the Elixir of Seven Seals begins with two contemporary concoctions, the Phoenix Elixir, or Lesser Elixir of the Book of the Royal Art, and the Dragon Elixir, or Ouroboros Elixir. The phoenix is above all a symbol or emblem of alchemy, the Royal Art, itself. It represents the completion of the Great Work: the transformation of base existence through death and rebirth to immortal life. As such it is identified with the sun and the cycle of night and day or darkness and light. The mythical phoenix builds a nest of branches that ignites to incinerate the phoenix, reducing the bird to ashes, out of which a new phoenix is born or hatched from an egg to live again. The immortal phoenix lives through an eternal cycle of death and incarnation. The phoenix is a universal ornithological symbol found in various forms all around the world. Garuda, for example, is the giant hawk-like bird and chariot of Vishnu as the sun god in Indian mythology. The phoenix is one of the most ancient and revered mythological animals in China. Where the dragon was traditionally the masculine symbol of power, yang, the phoenix was the feminine power, yin. 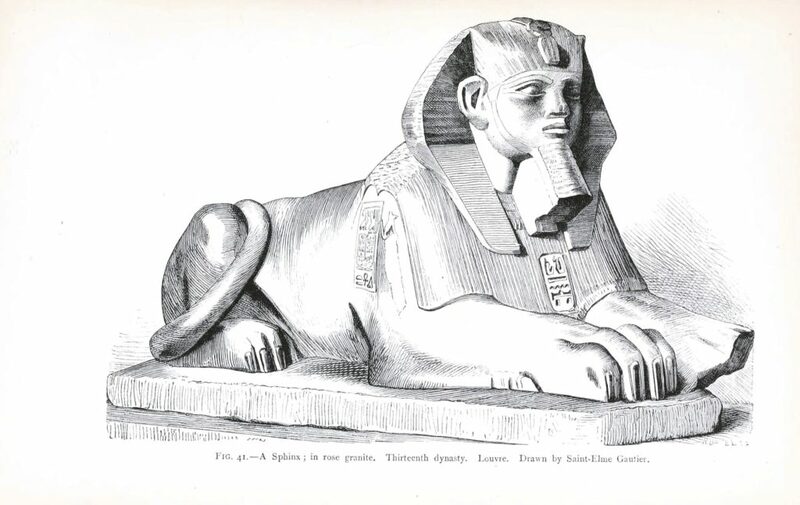 The phoenix was also the sacred bird of Heliopolis, the “city of the sun,” one of the oldest cities of ancient Egypt. It was known in the scriptural Book of the Dead as the heron or benu bird. The phoenix was associated with the god of rebirth, Osiris, the sun god Ra, and the rising sun or golden dawn. 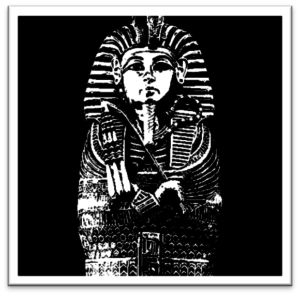 It was a symbol, like the ankh, of immortal life. The ancient Phoenicians proudly called themselves “sons of the Phoenix” and thus the Lebanese, descendants of the Phoenicians, consider the phoenix to be emblematic of the Lebanon and the capital city of Beirut. The first historian, fifth century Herodotus and the eighth century BCE poet Hesiod, who with Homer provided the earliest written sources of Greek mythology and religious tradition, were the first to mention the Greek phoenix, a peacock or eagle. Christians later identified the phoenix as a symbol of Jesus Christ and his legendary death and resurrection. The popular image of the firebird today as an eagle-like bird is derived from the classical Arabian form of the phoenix, adopted as a symbol by Renaissance and Medieval alchemists in Europe, and even used by Queen Elizabeth I of England as a royal emblem. 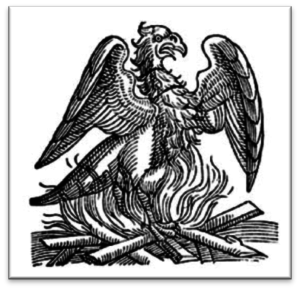 The phoenix is, of course, in prominent use today in alchemical culture spanning East to West. The dragon symbolizes both the beginning and the end of the alchemical process, from the lead of Calcination to the gold of Coagulation. It is slain – only to be reborn from putrefaction. 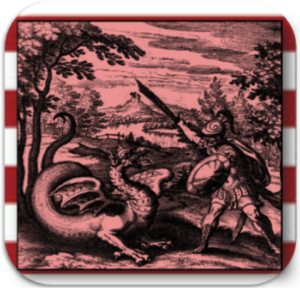 The ouroboros is a snake or dragon eating its own tail. It symbolizes the Great Work and Philosopher’s Stone of the alchemist, the Egyptian cycle of the year and the Gnostic conception of the eternal rebirth of the cosmos. It is related to the Orphic Aeon of pre-Hellenic Greece and the Nordic World Serpent. The dragon was the symbol of the ancient Chinese emperor, and is traditionally quite prominently paired with the phoenix to represent the opposites, yang and yin. 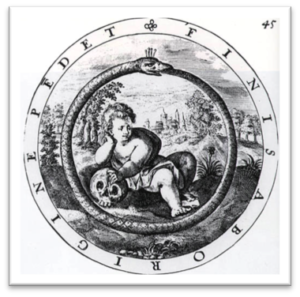 The ouroboros has been used in the design of magical talismans in the West since Roman times to symbolize the microcosm and the macrocosm, the mortal and the eternal, made One. As the mortal contemplates the eternal it realizes that it is, itself, the awareness of the universe. The dragon’s head eating its own tail is a symbol of that “feedback,” that extinguishing of duality, which is true clarity or illumination. 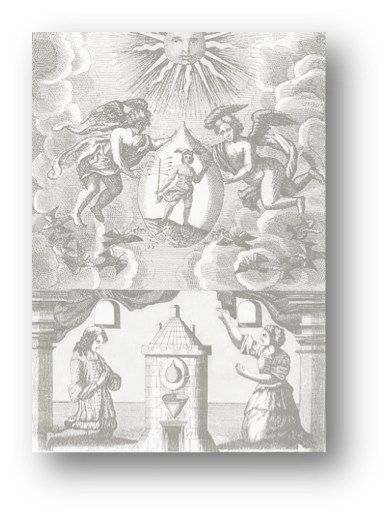 Before meditating the Elixir of the All-Seeing Eye, it is necessary to prepare the temple, as described in the Candidate’s Introduction Part VII: The Laboratory Temple and Experimental Alchemy. The Alchemist enters the Laboratory from the Northeast and bows to the temple. The Alchemist stands before the Ancestral Shrine facing the East and sounds the Ceremonial Bell once. “In the name of the One, the Law and the Good. Let us meditate upon the Rite of the Immortal Empire, Inner Temple and Holy Throne. With the Science and working tools of the Royal Art Society we craft the Philosopher’s Stone. We consume the golden spirit of the Holy Grail, which we style the Elixir of the All-Seeing Eye. We call this the Great Work. 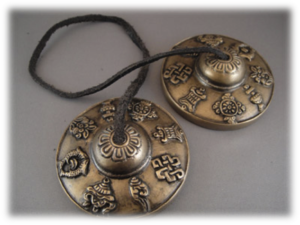 Any equivalent invocation may be used: Luna, Sol, Mercury; Brahma, Vishnu, Shiva; Dao, Yang, Yin; or Father, Son, Holy Spirit, etcetera. See Book of the Royal Art Volume II, ‘Book Three, The Master Alchemist:’ ‘The Four Primary Principles.’ Granting that as mortal beings we adapt and compete to survive in this world of limited resources, still we are ultimately One, a Cosmos seeking Good, which is governed by absolute Laws discoverable via critical thinking and Science. The understanding of these facts is, itself, a chief example of a Good and an expression of the most fundamental Law. Or, ‘a Member/Fellow of the Royal Art Society,’ ‘the Alchemist,’ ‘the Illuminatus,’ ‘the Dragon,’ ‘the Great God Pan,’ etcetera. Freemasons substitute the Gavel for the Ceremonial Bell in Masonic ritual. The Alchemist pours the water and the wine. The Alchemist lights the incense on the Ancestral Shrine and bows, meditating upon his or her forebears. He or she moves to stand or kneel facing East before the Altar of the Royal Art. The Alchemist lights the Sacred Fire, bowing afterward. Stand up slowly to avoid vertigo and loss of consciousness. Stand naturally. 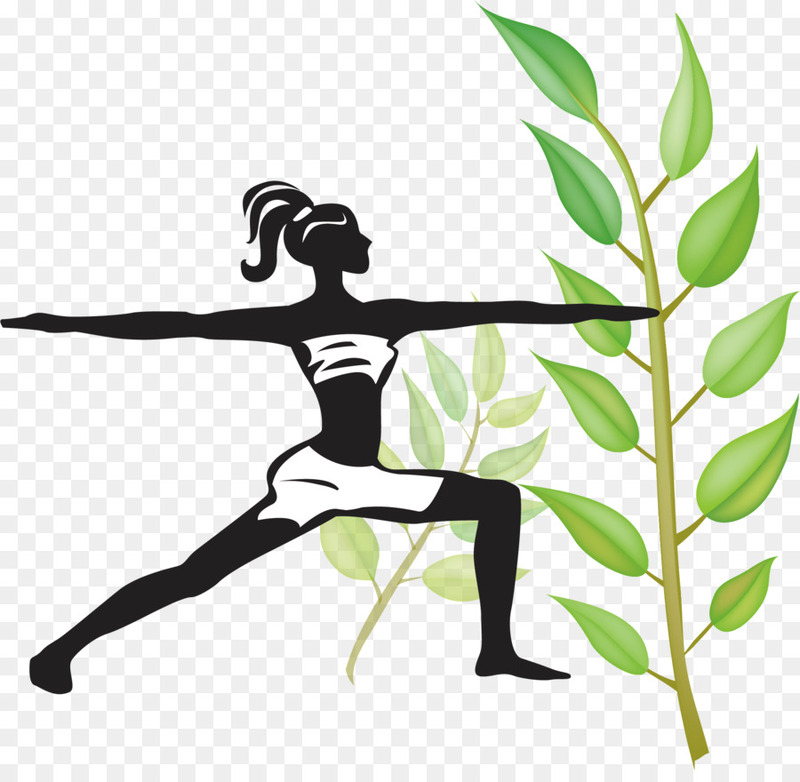 Rest in the “Natural Standing Posture.” Depending on time and intent, begin lunges from the Natural Standing Posture, or from the Rooted Posture. Lunge or step forward with the right leg toward the East. Hold the “Lunge Posture.” This may be done with appropriate arm movements. Stand in a natural standing posture or wider posture facing the rising sun of the East. The Eight Postures of the Phoenix Elixir may be utilized as preparation for exercise. For example, the lunges may extend into the taijiquan qigong practice known as the Eight Gates (bamen), as the first four gates are associated the four directions: ward-off (South), roll-back (North), press (West) and push (East). The other four gates are: elbow (Southeast), split (Northeast), pull-down (Southwest) and shoulder-strike (Northwest). The Eight Postures may also begin a yoga sequence, as the postures correspond with yoga poses: shavasana or lying pose – fetal position – balasana or Child’s Pose – vajrasana or sitting pose – malasana or Garland Pose (squatting) – tadasana or Mountain Pose – virabhadrasana or Warrior II Pose. Yoga may continue with eight further poses: the urdhva hastasana or upward hands pose – uttanasana or Standing Forward Bend – caturanga dandasana or Four-Limbed Staff (push-up position) – adho mukha svanasana or Downward-Facing Dog Pose – trikonasana or Triangle Pose (standing twist) – janu sirsasana or Head-to-Knee Forward Bend (one leg) – ardha matsyendrasana or Half Lord of the Fishes Pose (sitting and twisting) – halasana or Plough Pose (inverted pike) – repeating the first four poses and then cycling through the Eight Postures in reverse. Drag the right leg to the left leg. Bow to the East. Return to the Rooted Posture or remain standing, attend to the visualization presented below, and repeat in the other directions. End facing the East. Bow to the Sacred Fire on the Altar of the Royal Art to the east. Repeat the sequence with the left leg in the opposite direction (clock-wise). Optional: in ritual the alchemist may use the standard Phoenix Elixir 18 Foot Square Positions, Mudra and Bow. 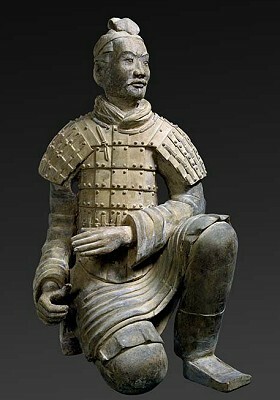 Facing the East, feet together, bow. Turn the body 45° as the left foot pivots on the heel to turn True North, making a 90° angle between the feet. Snap the right heel to the left; feet together. – 9. As above, North to West. – 13. As above, West to South. – 17. As above, South to East. Bow to the Sacred Fire on the Altar of the Royal Art to the east. Reverse. Wrists straight, left hand is receptive, right hand is firm, right hand is a closed fist in the left hand. The left hand makes a 90° angle with the fingers. Thumbs are straight, pads touch to form an equilateral triangle with the hands. The thumbs of the Phoenix Elixir Mudra point up at a 45° angle from the body’s center of gravity. The arms rise and stop when the triangle made by the thumbs and hands arrives at the level of the Third Eye, one handbreadth from the skull. Bow at the waist to an angle appropriate to the occasion, keeping the knees slightly bent and the back straight. Never lower the eyes. 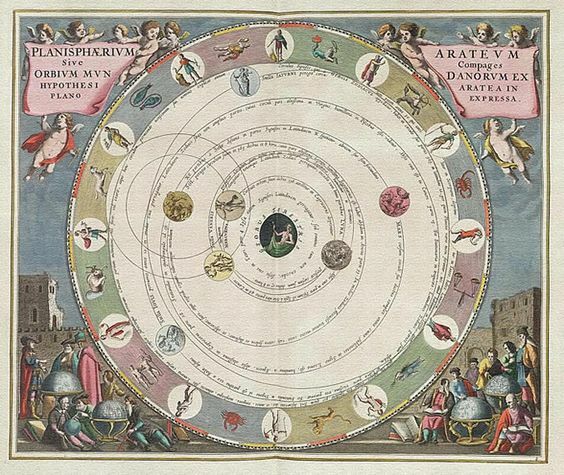 Visualize the landscape of the earth to your east, with all the flora and fauna, people and things, into the heavens and to the ends of the macrocosmos. 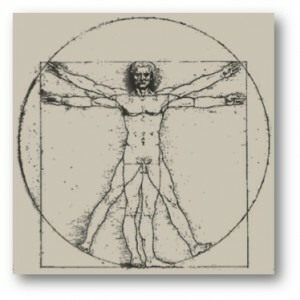 V. In each direction visualize the corresponding element and parts of the human body as below. This secular visualization with the mind’s eye is accompanied by an act of universal blessing. The blessing may be silent, it may be prepared beforehand, or it may be ad lib. 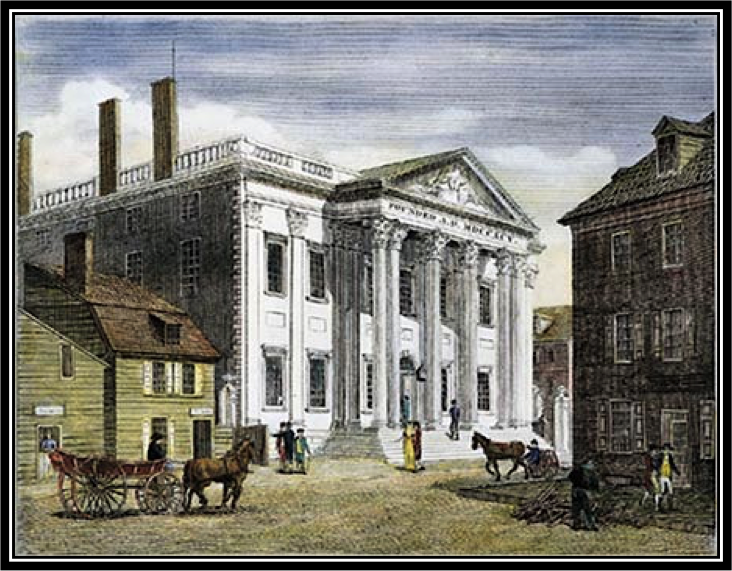 The Just and Legal Sovereign State and the Unjust and Illegal Sovereign State: the Invisible Empire, Heavenly Kingdom or City of Peace; Liberal Arts and Science Education; Class Difference and Access to Shelter, Clean Water, Nutritious Food and Medical Care; Wise Industry and Finance for a Sustainable Global Economy, Just Government, etc. An example of how to accomplish the visualization of alchemical cosmology is to read the “Scroll of Time” from the Recipe of the “Elixir of the Feast of the Leaves of the Tree of Life or Rite of Creation” from the Grade of the Apprentice. In the beginning, from nothing, were divided the heavens and the earth. The Source divided this one universe according to the absolute Law of Necessity. Thus history began, and so shall it end, eternally, returning to nothing. Bless the Void, the One, the Law, the Good and the Cosmos. At first, the whole universe was pure change, or movement, or motion, or heat, which expanded in all direction to create, at once, space and time. Bless the Solenoid of Existence, the Point within the Center, the four dimensions: line, plane, solid and time. Bless Above, Below, North, South, East and West. Even in expansion, which is called weak nuclear force and electromagnetism, existed contraction, called strong nuclear force and gravity. Bless the four forces. Thus the universe was created hot and cold; plasma, gas, liquid, and solid. Bless the four states of matter. So space and matter were formed, and the chemical elements, and the astronomical forces and bodies. Bless the astronomical bodies and all chemicals and compounds. 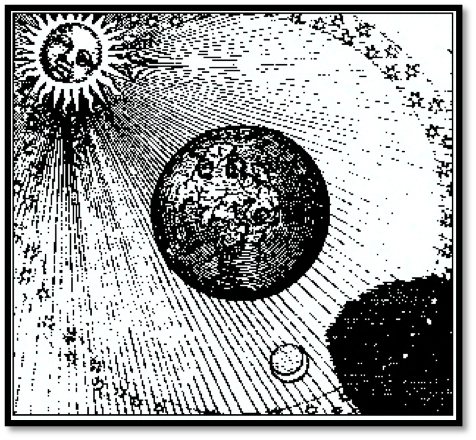 In time, earth was formed as part of a solar system centered about one star; its sun. Surrounding the earth was atmosphere, and upon the earth the light and heat of the sun penetrated the sea and dry land. Bless our solar system and all solar systems. Single-celled spheres of life formed in the sea, and filled the atmosphere of the earth with the chemical element oxygen. Vegetation and animals filled the sea, the waters and the dry land. Survival in a competition for limited resources depended upon natural selection and conscious, mindful cultivation. 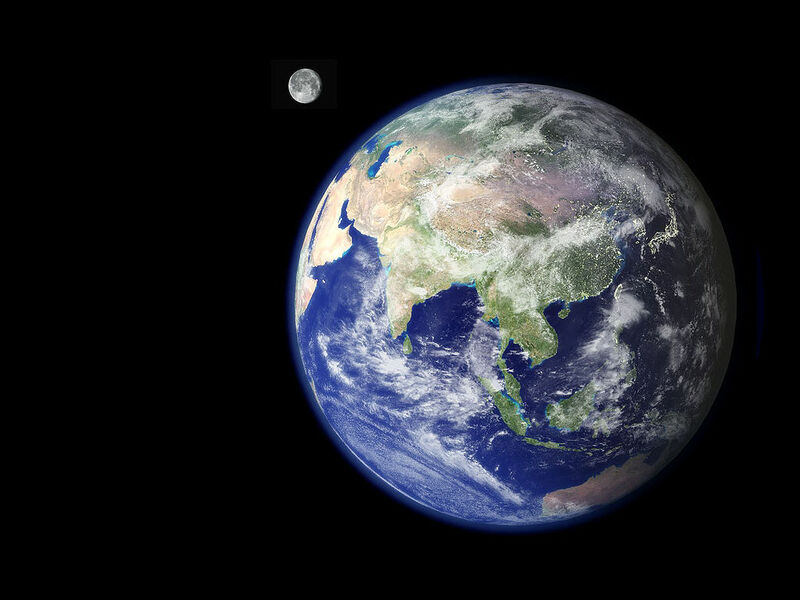 Bless the minerals, vegetables and animals of the earth and the whole cosmos. Homo sapiens was born in the image of the perfect child, the ideal person, the macrocosm and microcosm united: with contraction and relaxation, with wisdom and understanding, with mercy and love, judgment and strength, memory and will, with pure awareness and compassion, imagination, emotion, reason, perception, sensation, and a physical body. Bless all enlightened beings. Energy created Homo sapiens with the ability to learn the Laws of Necessity, to know the true names of real forms, and to choose to embrace the One or follow falsehood and evil. The Laws of Necessity preordained all things, so a Homo sapiens must make decisions, but his or her choices are predestined. Bless all good creatures, all the good people of the world, our nation, our communities, our friends and family. Humans, like their gods, were, although highly flawed, singularly successful at science and government. Bless the gifts of science and government. This is the foundation of the Laws of Necessity and the knowledge of the Way, the universe, life, and humankind. From hence have I come, and thus now, here I am. Return to the Natural Standing posture; Body Posture; Rooted Posture; Seed Posture, Fetal Position/ Recline Posture and Empty/ Death Posture. Leave the flames burning and return to the Inner Temple of the Alchemical Laboratory from the north side via the North-East portal. Cultivate the inner guide. 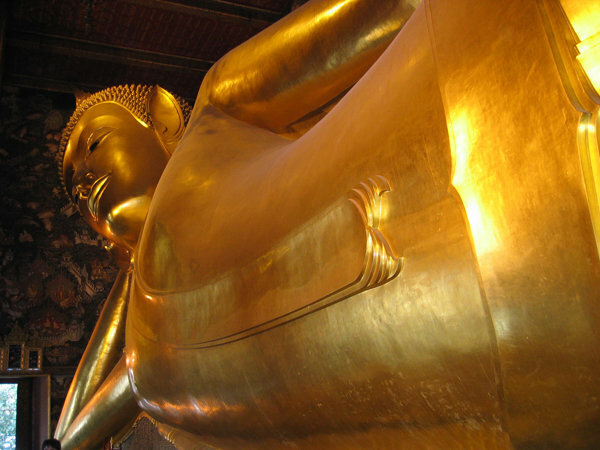 Assume your “Meditation Posture” before the Altar of the Royal Art. Cultivation may be practiced on the Holy Throne. As a matter of ritual, the Alchemist sits in meditative posture, stands or kneels before the Altar of the Royal Art and continues to the Dragon Elixir and the Elixir of the Seven Seals. Sitting in a posture, relaxed, beyond discomfort, concentrating and breathing softly, the alchemist can feel the Dragon or serpent of energy. It is like the serpent energy goddess Kundalini of the Indian yogic Shaivite scripture, the tantras, coiled three and one half times about the base of the spine. 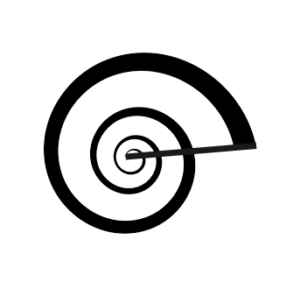 One may note the same spiral depicted twice on the floor of the Royal Art Society Laboratory. The alchemist opens the seven seals in this manner in preparation to meditating the seven seals in greater depth. The Ouroboros serpent or dragon is your life-force, and it must raise its head upward within and to the rear of the spine at the lowest Seal, at the perineum; and when it does you open the Seal by visualizing and feeling a disk opening like a lotus flower or a luminous globe in that area and breathing deeply with one full inhalation and exhalation at least once. Each Seal must be likewise opened in turn as the serpent continues to rise. Allow the serpent to pause as you meditate upon each Seal. This meditation follows a cycle of at least fourteen breaths. Contemplate the formation of all the solids in the universe. Span out and see the Big Bang and the entire Cosmos as it blooms in space and time. The second Seal is two inches below the navel, the center-point. Here, meditate on liquid, especially water. The third Seal is the solar plexus. When you concentrate on this point, contemplate the formation of gas from heat. Visualize the heavens and the sky. The fourth Seal is the heart. Research to find all you can learn about heat. What is heat? What is an electric charge? What is the lowest and the highest temperature? What is nuclear force, what is electromagnetism? Then, when you have gathered all your material, meditate on it and contemplate it. Where and when, exactly, was the beginning of heat? Where will it end, and how does it proceed? How does heat relate to the holistic binary state cosmology? Really figure out the big picture as it relates to heat. Get into your posture and meditate on the Seal. Fire is the symbol of heat. Cultivate heat, will and love with this Seal. These are the four elements. The fifth Seal is the throat, Spirit; pure awareness. The Spirit is the Good of the One and the Universe. Just as the throat and mouth form the voice of the human being. The sixth Seal is the Third Eye on the forehead just above the eyes. And the illumined observer, the All-seeing Eye. The seventh and final Seal is the crown of the head as the One is the Crown of existence. At this stage, the serpent’s head rests above that of the alchemist and a shower of light or energy pours down the spine and the body like a life-giving dew or nectar. 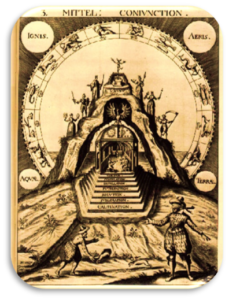 When the body is drenched in the life-force, the Ouroboros begins its journey back down the front of the spine, and the Seven Seals are consecrated with life and love as the head of the serpent passes by each one in turn, beginning with the seventh Seal at the crown of the skull. The meditation ends when the energy is circulating and the Dragon is again coiled at the base of the spine. The energy may be circulated this way in this ring, the Microcosmic Orbit, cycling through all the stages of the alchemical process. Calcination is the first stage of four in the three-fold cycle of death and rebirth: the Cycle of Earth, followed by the Human Cycle and the Cycle of Heaven. In meditation posture the alchemist creates an open flame in the philosophical furnace, called the athanor, at the base of the spine. This is another expression of the Sacred Fire that burns upon the Altar of the Royal Art. He or she then visualizes the alchemical furnace with a beaker sitting atop. The beaker contains the black LEAD of the base self. The alchemist applies heat to reduce the raw material, lead, to chalky white ashes until the fire ceases to have any effect on the ash and the ash stops burning. The white ash or white tincture symbolizes the five elements: the four material elements and the quintessence, Spirit or life-force. Daoist alchemy places this initial stage of the guided visualization in the perineum (the base of the spine) and the One-Point, the human center of gravity. This whole area is called the Dantien, or Elixir (Cinnabar) Field. Dissolution means to dissolve the gross elements of the alchemist, the microcosm, in the cosmos or macrocosm. In Chemistry, dissolution is the operation whereby a solid, liquid or gas forms a solution in a solvent. In alchemy Dissolution refers to the natural corrosive power of water on metal that produces rust and the oil of vitriol. It is the process of breaking down the WHITE ASH or WHITE TINCTURE, which is now symbolized as the SALT iron sulfate (green vitriol), with WATER, to produce red iron oxide (RUST) and sulfuric acid (OIL OF VITRIOL or CINNABAR). The latter two symbolize the gross elements and spirit respectively. 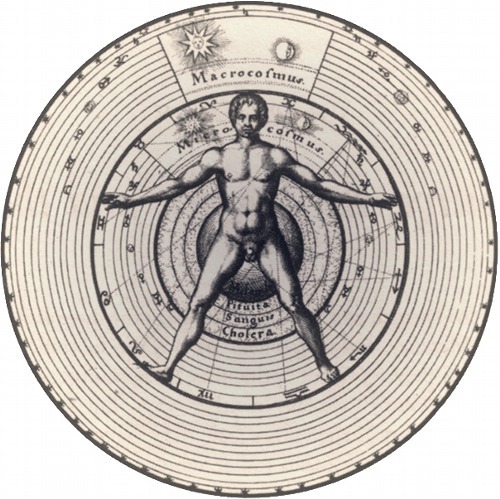 The alchemical symbolic operation of Dissolution occurs at the human center of balance, the lower elixir field. Here, the alchemist meditates on liquid: water, rust and cinnabar or the oil of vitriol. 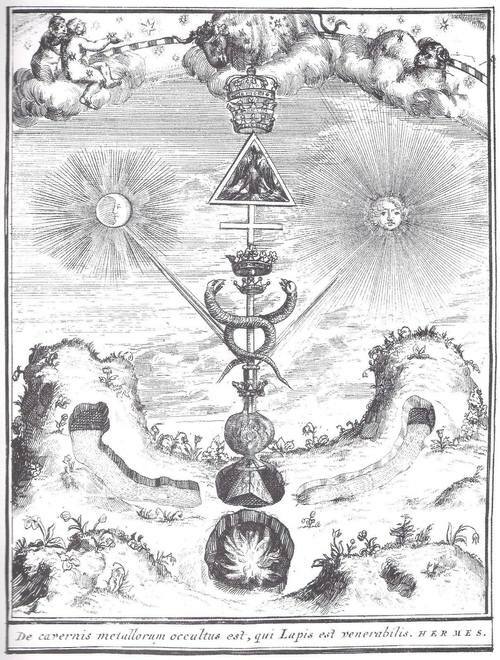 At this stage in the visualization the alchemist divides the white tincture, symbolizing the isolated but united five elements, into two parts. The alchemist pours the white tincture that remains from the Calcination process into a vessel of WATER, usually a beaker, until the tincture is totally immersed in WATER. Beginning as a slow drip, the microcosm as drops of WHITE ASH or WHITE TINCTURE becomes a stream, until finally the whole tincture is immersed in WATER. Then as a SALT, the GREEN VITRIOL, the microcosm immersed in WATER breaks down into RUST and the RED TINCTURE, the OIL OF VITRIOL or CINNABAR. The RED TINCTURE or symbolic SULFURIC ACID, in turn, causes the dissolution of all the traditional metals except the noble GOLD or SPIRIT. In inner alchemy Dissolution means to dissolve the gross elements of the microcosm, leaving only the pure consciousness, the observer. The four material elements dissolve and separate from the ‘SPIRIT,’ or pure “no-mind” awareness. Separation means to totally separate the dissolved elements from the chymically isolated SPIRIT through a process of filtration or similar method. The recipe at this stage is referred to as RED TINCTURE or CINNABAR. 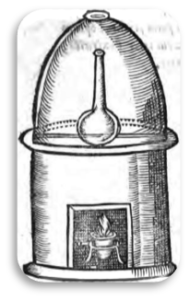 The dissolved elements and the SPIRIT are taken out of the WATER and exposed to the AIR, where they are inspected for quality, and impure or unworthy material is separated out as WHITE TINCTURE (the old white ash of the calcinated microcosm) and set to the side (in the heart) for the next operation. The Western alchemist carefully decides what to keep and what to dispose of in his or her refreshed world-view, personality and Goal Schedule, subjecting all to a Cost – Benefit Analysis. This process is likened to the cutting and dividing action of the sword. To the fundamentalist Daojia (a secular Daoist), however, it is simply the spirit turned inward to observe itself; maintaining the One. In the Elixir of the Seven Seals, the operation of Separation occurs at the solar plexus superior to the abdomen. Contemplate the formation of gas from heat. Visualize the heavens and the sky. Under the dome of the sky, what is to be preserved, and what is to be destroyed? Conjunction means to combine the separated WHITE and RED tinctures back into one matter. This stage is the union of the opposites; the Spirit returns to the material world, the earth. The ouroboros, that great serpent, has eaten its tail. This is the end of the first of three death and rebirth cycles, the cycle of earth. The alchemist pours the contents of the two vessels (red and white tinctures) into a large, central chalice. The inner feminine and masculine archetypal energies, the sun and the moon, macrocosm and microcosm, God and Goddess, Emperor and Empress or King and Queen, unite in the Chymical Wedding and rite of consummation. A hermaphrodite child is born of this carnal union, a new ruler conceived in the power of love, the archetype of the Primordial Human. This is the purified First Matter, quintessence, Spiritual Fetus, the true self or inner guide. The Seal of the operation of Conjunction occurs in the heart. Alchemical fermentation is a two-step process consisting of the putrefaction and resurrection of the recipe, that is, the Primordial Human, Spiritual Fetus, spiritual child or inner guide. 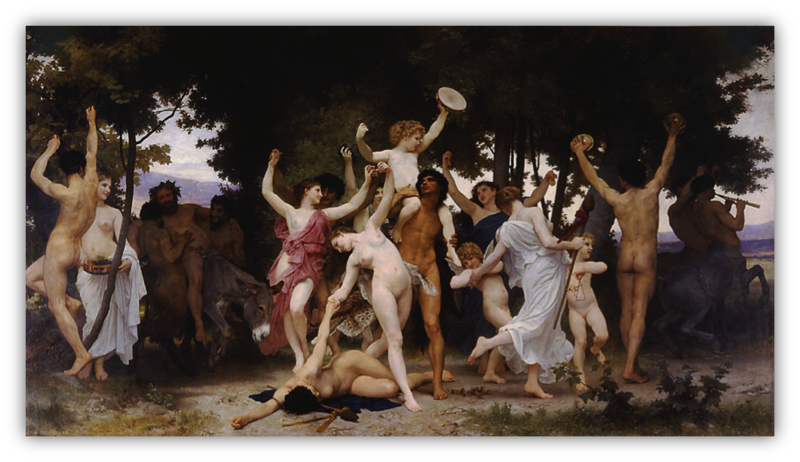 This is the first half of the second cycle of death and rebirth, the Human Cycle. The spiritual child must experience the pain, sorrow and death that accompany everyday life. Every aspect of the microcosm must be purged; all must be given in humility and selflessness. The ego must die completely. This putrefaction is necessary for the occurrence of rebirth and renewal. 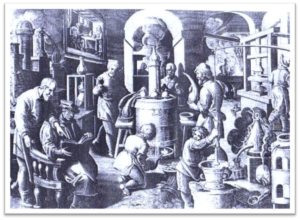 Paracelsus noted the BLACK issue of this phase, which precedes Distillation where the tincture turns WHITE, and the GOLDEN tincture of Coagulation. The Seal of the operation of fermentation occurs in the area of the throat. The four elements have given way to the fifth element, SPIRIT. The Spirit is the Good of the One and the Universe. It is the Messenger or Voice of the Cosmic Human just as the throat and mouth are the voice of the human being. At this stage of the recipe the alchemist is initiated into the Mysteries directly by the Primordial Human, which has been expressed as the gods Thoth, Hermes, Mercury, Mithra, Adam, Yeshua (Jesus), Odin, Balder, Lugh, Rama and Sita, Hanuman, Ganesh, Buddha, Kwan Yin, Lord Lao and many others. The tender new consciousness of the alchemist grows in the same way that a benevolent ferment or bacteria grows inside an organic solution, as in the production of wine from grapes. Like a phoenix, out of the void of putrefaction emerges the GOLDEN ferment, the true self, reborn. And freewill to choose between Good and Evil. 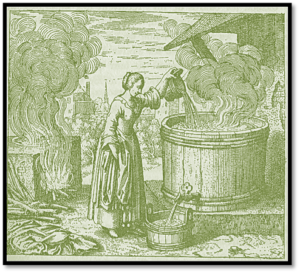 Alchemical Distillation means boiling the ferment to produce evaporation, then boiling the condensation in a separate receiver, to further increase the purity of the elixir. This means that all thoughts (the first vessel) and feelings (the second vessel) are brought to rest in tranquility and purity. The two vessels may be conceived of as any and all opposites or vibrations. All is calm and reflective like a mirror. The elixir or microcosm goes beyond emotions, thoughts and sense of self, and rests in the void. The Daoist alchemist rises into the heavens on the back of a dragon to become an illumined and immortal sage. This is the final part of the Human Cycle, Albedo or the WHITE Stage. Distillation occurs in the Third Eye, slightly above the eyes, on the center-line of the forehead. This Seal is the Law, the laws that underlie nature; and it is the observer, the All-seeing Eye. The Elixir of the All-Seeing Eye of the Royal Art Society: Rite of the Immortal Empire, Inner Temple and Holy Throne is traditionally visualized in the Third Eye. Its consummation is the final stage of the Elixir of Seven Seals, Coagulation, therefore the elixir is described under that critical process. Coagulation is the solid material distilled from the ferment. This is the third and highest cycle of rebirth, Rubedo the RED phase, the Cycle of Heaven that produces symbolic GOLD. It is represented by the symbols of the Phoenix, the king, the rose and blood. Coagulation occurs in the final Seal at the top of the head and above. It is the crown of the microcosmic alchemist as the One is the Crown of existence. It circulates through the microcosmic and macrocosmic orbits. It reaches throughout all space and time, and expands beyond the shadowy, murky primeval realms, to that which cannot be named. The alchemist may adjust his or her posture to the half-lotus or lotus position like the yogis, daoists and Buddhists, or the “Indian style” of the Americans, with legs crossed in front. Coagulation is its own elixir or meditation. It is called the Crown and is simply no-mind, zazen, or mindfulness meditation. It is the apex of meditation and the very center of the Royal Art, the goal of every elixir. This meditation may be done by itself as a daily morning ritual, or morning and evening, or as often as possible. 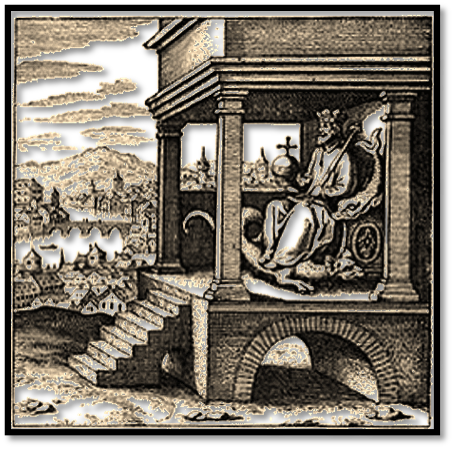 Standing at the Ancestral Shrine within the Inner Temple of the Alchemical Laboratory, the Alchemist declares, “I sound the Ceremonial Bell and ascend the Holy Throne (or ‘throne of the High One,’ Or ‘throne of eternity’).” The Alchemist sounds the bell twice and ascends the Holy Throne. The Alchemist visualizes himself (or herself) as the High One, the Immortal Emperor (or Empress) upon the Holy Throne. The High One sits on the Holy Throne in the East of a circular temple surrounded by the four elements and the eight cardinal points of the compass rose, on a fertile mountain island in the center of the universe. There are seven seals upon the spine of the immortal monarch and the twelve spirits of life on their thrones surround the throne of eternity. All of the Immortal Illuminati surround the High One. The life of the alchemist, all of human history and the history of Earth, amount to but a speck among the dust of galaxies below the High One. 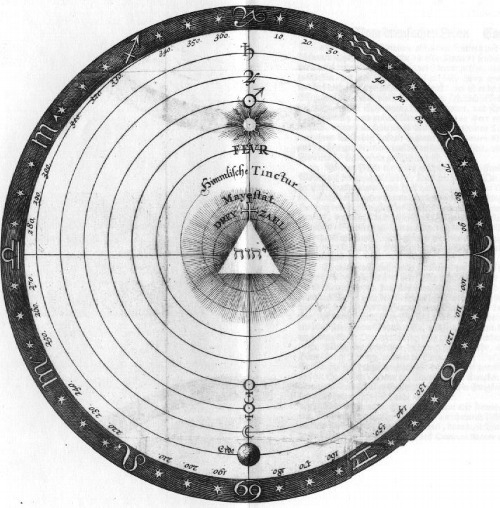 Visualization of the ideal laboratory, the Alchemical Palace or heavenly city, is unique to each individual. For some, a sea surrounds a four-cornered castle, revolving, with music, wine and feasting within, where there is no disease or old age. Other palaces or temples may grow out of a forested mountain peak. Some are surrounded by a moat that symbolizes the physical body. The outer walls are the senses, emotions and thoughts. The gates are purification, the inner guide, humility, awareness and observation. A river is the essence of life; health, love and communication. The highway following the river to the castle is the Way of Life; sacred honour. The tree in the garden is truth and enlightenment. The temple or castle within is tranquility and peace. The Alchemist then consumes the water, bread and wine, reciting, “I consume the water; the source and mother of life. I consume the bread, the staff of life. I consume the wine; the (symbolic) blood of the living god, the god of life, the Primordial Being, the eye of the cosmos.” In group ritual the participants may file clockwise to the East to take part in the consumption of the water, bread and wine. The function or duty of the Alchemist is merely to continuously read the Book of the Royal Art and related scripture aloud and meditate. The High One, the Immortal Emperor, sitting on his Holy Throne, opens his mouth and recites. The reading should be spoken in a solemn tone or chanted, beginning with “Let us now eat the leaves of the Tree of Life. 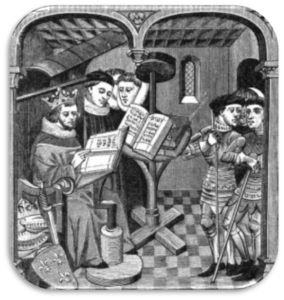 I recite the…” and the title of the reading. An appropriate reading ought to be chosen and practiced before the ritual, such as from the Book of the Royal Art, or something acceptable to one’s identity or cultural preferences. 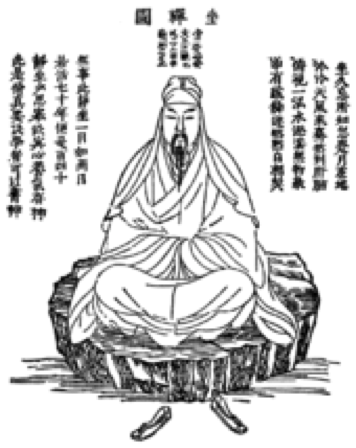 A short, effective reading from the Laozi might include, for example, Chapters the first, second, fifteenth, sixteenth, twentieth, twenty-first, twenty-second and twenty-seventh. The seventh century CE Chinese Buddhist Heart Sutra might also be recited here. Another good reading is the whole Qingjing Jing or Classic of Purity and Stillness, a Tang Dynasty Daoist classic. The Dao has no form. It created Heaven and Earth. The Dao has no emotions. It maintains the revolutions of the sun and moon. I do not know its name so I simply call it the Dao. The Masculine is movement and the Feminine is stillness. Emerging from the source and flowing outward, all things are produced. The pure is the source of the opaque and movement is the foundation of stillness. When a man remains pure and still, Heaven and Earth return to the Primordial. The human spirit has purity, but the mind disturbs it. The human mind has tranquility, but emotions disturb it. Overcome emotions completely, and the mind will be calm. Clear the mind, and the spirit will return to purity. Then, the six thieves (sight, hearing, smell, taste, touch and thought) will not arise, and the three poisons (lust, anger and ignorance) are destroyed. Whoever cannot do this has not yet cleared the mind or overcome the emotions. When one contemplates these three things, one observes only nothingness. This nothingness is also observed to be emptiness. The emptiness of nothingness is emptiness. Nothingness being nonexistent, there is true stillness. In true stillness and tranquility, how can desires arise? In permanent true stillness there is harmony with the universe. One’s true nature permanent and undisturbed, there is eternal purity and true stillness. In purity and stillness one gradually enters the true Dao. Having entered the true Dao, one is a possessor of the Dao. Although it is said that one possesses the Dao, one actually has attained nothing. Rather, we say that one possesses the Dao, when one begins to transform all mortal beings. Only one who properly understands this is worthy to transmit the Dao of the sages. Superior gentlemen avoid conflict; inferior people enjoy disputes. Superior gentlemen do not flaunt their virtues; inferior people cling to and display their virtues. Those who cling to and display their virtues are not possessors of Dao and Virtue. 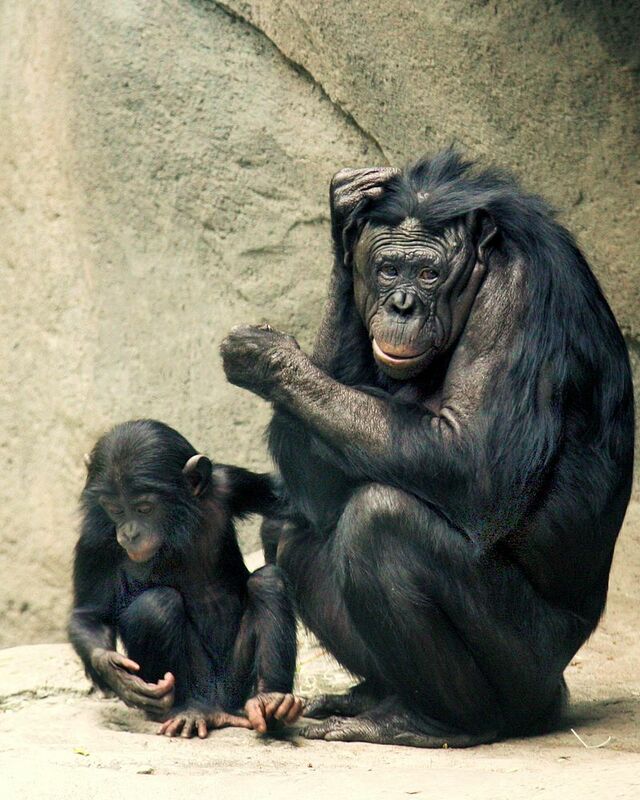 The reason people fail to realize the Dao is that their minds are overcome and corrupted by emotions. When emotions overcome the mind, the spirit is disturbed. When the spirit is disturbed, one is attracted to worldly things. When one is attracted to worldly things, one pursues them with lust and greed. Greed and lust arising within lead to disappointments and annoyances. These in turn lead to disordered thoughts, which cause anxiety, and trouble both mind and body. One thereby falls into shame and suffering, wandering aimlessly through the phases of life and death. Sunk into a sea of misery, one forever loses the true Dao. The true and eternal Dao can be obtained naturally with inner awareness. Those who understand the nature of the Dao will abide forever in purity and stillness. What was it that at first us made? And what hath grace a fresh conveigh’d? Whence was’t (pray tell us) we were born? How came we then again forlorn? Who was it (say) that us conceived? Who suckled, nursed, and reliev’d? What is it we to our parents owe? What do they us such kindness show? Who gets herein the victory? Can Love by search obtained be? How may a man good works perform? Who into One can two transform? The Alchemist may do this no-mind meditation for five, ten or fifteen minutes and then stretches before rising. If one wants to spend more time in meditation, one can proceed with physical exercises, study and labor. The meditation concludes with the extinguishing of flames and sounding of the Ceremonial Bell. 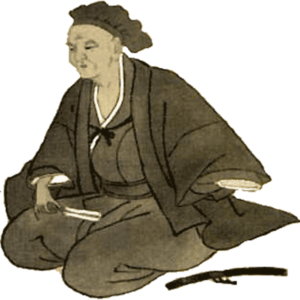 If the Alchemist schedules it he or she returns to the Outer Temple of the Lower Temple to cultivate the material body with physical exercises: neuro-muscular stretching or warm-up, hatha yoga, qigong, walking the circle, taijiquan, bagua, kung fu, sticks, staff, swordplay or other appropriate exercises. If the Alchemist schedules it, he or she will cultivate the mind to provide for the necessities of life. This includes research in the liberal arts and the sciences, scientific experimentation and ritual like that taught in the Royal Art Workshops and practiced in the Royal Art. The alchemist may create a projected timeline based on goals and estimations of when they will be fulfilled. Inner alchemy is medicine. This Goal-Schedule is the plan for applying the proper medical treatment to each existing disorder in one’s life and proper sphere in the world. It requires a list of big picture personal goals, an organized to-do list with a calendar (for daily schedule and project management), and annual financial worksheets (household and any business Balance Sheet, Cash Flow Statement, and Income Statement) with projections for the next year, at least. Return to the Inner Temple of the Alchemical Laboratory from the north side via the North-East portal. When the incense has burned out, the alchemist sounds the bell thrice, to announce the end of the meditation. “I sound the Ceremonial Bell to conclude the Rite of the Immortal Empire, Inner Temple and Holy Throne. “In the name of the Royal Art Society may we always give thanks and celebrate that we have faithfully produced and consumed this Elixir of the All-Seeing Eye. Let us rest in silence before departing the Inner Temple of the Alchemical Laboratory. In the name of the One, the Law and the Good.” The Alchemist stands facing the door, breathing in silence, before leaving the chamber by the Northeast. This is the Art of doing nothing.